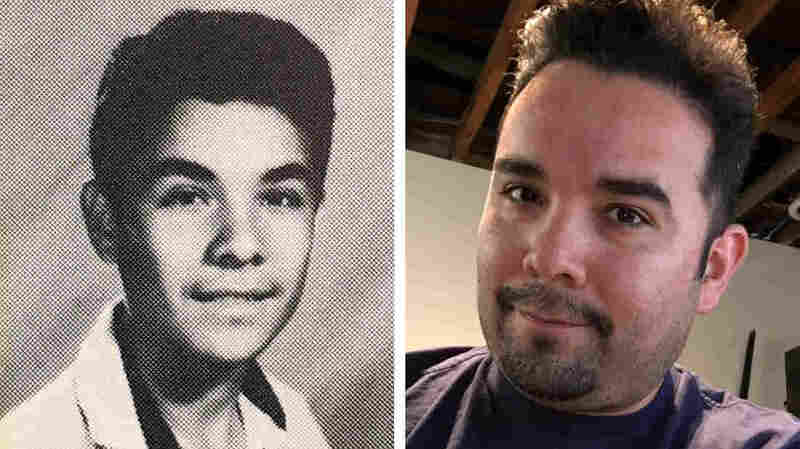 'Aggressive Yet Sublime': A Looter, Nirvana And The Los Angeles Riots Gilbert Monterrosa was 15 years old during the 1992 riots. He and some friends decided to loot a Fedco department store where he found something unexpected — Nirvana's album, Nevermind. Gilbert Monterrosa was 15 years old (left, from his high school yearbook in 1992) during the Los Angeles Riots. He and some friends decided to loot a Fedco department store where he found something unexpected — Nirvana's album, Nevermind. Monterrosa was 15 at the time — a sophomore at James A. Foshay Junior High, now known as James A. Foshay Learning Center. He lived with his mom and two younger sisters in what was then known as South Central Los Angeles, and he and his mom had immigrated from El Salvador. Monterrosa says he and his siblings weren't allowed to watch TV after 5 p.m., so when the riots started on April 29, they didn't know anything had happened. They just went to bed like they always did. It wasn't until the next day when Monterrosa was walking to school and bumped into his friend Luce and her mom that he first realized something was going on. Luce's mom insisted Monterrosa turn around and go back home. She said she would call his mom and explain the whole thing. As they walked back, Luce explained. "I was completely oblivious as to what was going on," Monterrosa says. "Luce goes, 'You didn't watch did you?' And I go, 'No what happened?' She goes, 'S*** is gonna go down. Last night people were burning cars and flipping them over and things were going on on television. It might happen again today.' And I said, 'What? C'mon man!' "
It wasn't long before two of Monterrosa's friends came over and insisted they go out and steal too. At first, he did not want to go. That was, until a neighbor played on Monterrosa's major weakness. "It was known across my neighborhood that I was a mama's boy," he says. "That I listened to everything she had to say. And because my dad wasn't around, my stepdad wasn't also around, I had to play the machismo card and show them that I was the man." "Eduardo, I remember, said, 'And this little b**** is going?' and it just burned me up inside," he says. "And I said to him, 'Yeah I'm going!' "
"It was as if somebody had opened up the doors to Fedco, and they were just giving stuff away," Monterrosa recalls. "People that I knew that were in opposing gangs were helping each other out, and there's stuff everywhere on the floor — clothing, food — everything is just chaos. Absolute chaos." Monterrosa remembers being pretty nervous, but then he started to think that there was one thing he might really want, something his mom could never afford — a boombox. That's because Monterrosa was really into music. "LL Cool J, Ice Cube, NWA, a lot of R&B, a lot of hip-hop, that was my life," Monterrosa says. "Because that's all you listen to, growing up in South Central." "I looked down on the floor, and there was this album cover with a baby swimming, and a dollar bill on a hook," he says. "And I saw that and I said, 'What the f*** is that? What is that, right?" The album was Nevermind by Nirvana. "It was unreal. It was like opening an entire world of music to me," Monterrosa says. "It was sonically aggressive yet sublime at the same time. There were these breaks in the music where everything was just really hard, and then it just came down and built up again. And in my mind's eye I could picture the riots as I was listening to 'Smells Like Teen Spirit.' And it just became the soundtrack of that day." That CD got Monterrosa into a bunch of other music — things he'd never heard before. "It led me back to The Clash, and The Clash led me back to The [Rolling] Stones, and The Stones led me back to The Beatles," Monterrosa says, "and then I listened to Bohemian Rhapsody, and then from there I went on to La Traviata." It was right around this time that Monterrosa's mom decided to move to a new neighborhood — Silver Lake, which is on the east side of LA — and he started going to a new school. It was unreal. It was like opening an entire world of music to me. ... And in my mind's eye I could picture the riots as I was listening to "Smells Like Teen Spirit." And it just became the soundtrack of that day. "These guys were like, friends with the jocks, the cheerleaders, the burnouts, the cholos," Monterrosa says. "I talked to everybody because I was part of that group of guys that listened to alternative music." Monterrosa says if he hadn't changed his music and his clothes, at the same time he changed his neighborhood, he probably would have ended up getting in trouble, like his other friends back in the old neighborhood. "If I would've stayed in South Central, I know for a fact that I would either be dead or in jail," he says. "My ego wouldn't have allowed me to be a punk. Just like I was taught to go into the LA riots by Eduardo, these guys were able to push my buttons, and if you have that much machismo, growing inside of you, and you come from a broken home, where you have to be the man, I probably would've been part of this group of guys that would have ended up getting arrested or getting killed by another gang of people." It wasn't all easy in the new school. Monterrosa eventually dropped out. But then he got his GED, and now he works in IT for a security company that allows you to monitor your home through your smart phone. He's married and has a little boy. His mom is retired, and he and his sisters take care of her. "I still listen to that album," he says. "And instead of seeing a Fedco on La Cienega and Rodeo, I see a Target there now. And I'm listening to this, and I go, 'Man, this is where I heard you for the first time.' It's like a really bad relationship, yet a really good relationship, that you can't forget about." 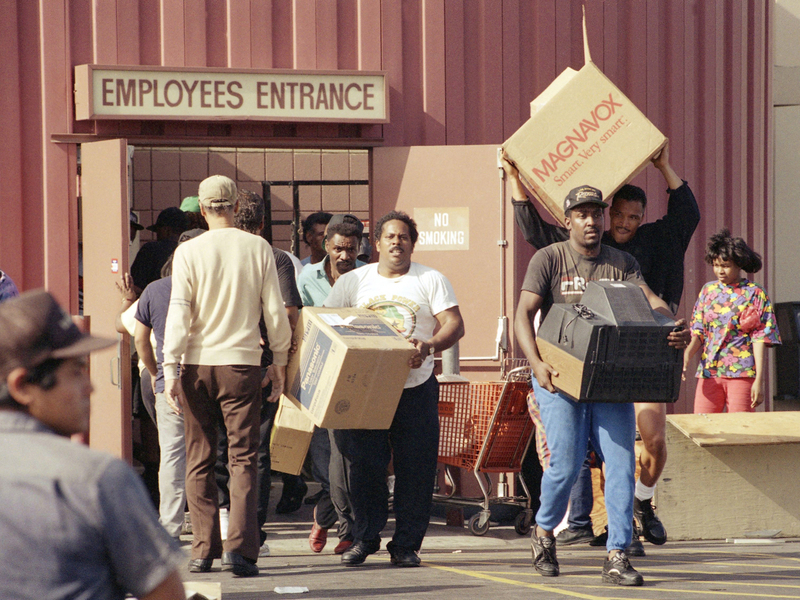 NPR's Anjuli Sastry produced and Melissa Gray edited All Things Considered's series of reports on the 25th anniversary of the Los Angeles riots.